After reading the big build up from Mr Wellbeloved I think it’s a big disappointment. The new logo is predictable and reminiscent of many similar images. I would have expected better from a ‘top designer’. The new badge is shockingly bad. It’s bland and irrelevant. 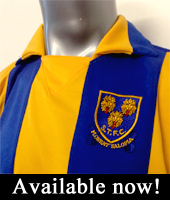 Salop has nothing to do with lions; the club, town and county badge is the Loggerheads. I wouldn’t want to buy any other merchandise with that thing on it, including shirts, as I find it faintly embarrassing. Just as blue and amber is part of our unique identity, so is the Loggerheads. Loads of other sports clubs/organisations have lions; now we’re just one of the crowd, no matter how many checks it apparently passed. Shame. To believe that you can’t create a badge that STFC can own, based on our traditional loggerheads identity, is nonsense. Listen up STFC, ignore your supporters at your peril. I’ve given myself a little time to digest this new corporate image of the club I love before commenting, and my first impression still stands. Millwall. It doesn’t ‘feel’ Shrewsbury Town FC. It does look very generic, very bland. It’s similar to the style of a US sporting franchise logo, not a club with a real history and community standing. Take away the Shrewsbury Town wording, and could you associate it with STFC? Not convinced. Frankly I’m disgusted by the new badge. I think it’s a shame that we are going to replace our current unique and charismatic badge with a lifeless waste of money! It’s dreadful, looks plain and too similar to Millwall, Chelsea etc. Why did the club insist on a new badge anyway? Trying to keep up with the modern corporate image? Personally I think the Loggerheads was one of the best and most unique crests in the football league! We can talk about clip-art lions, copyright issues, brands and making money as much as we want. The fact remains that the logo says nothing about the club, who we are and where we are from. I will not buy anything with that logo on. The heraldic badge showing the three Loggerheads is iconic and in my view is immediately recognisable as the badge of Shrewsbury Town. It also has historic value and should be preserved as such, whereas the clip art lion could be representative of a multitude of organisations. The club didn’t seem to have much difficulty in getting rid of the ridiculous Shrew badge back in the 1980s; hopefully they will see that there is a growing groundswell of opinion and ditch the Lion in favour of the Loggerheads. I remember seeing the design at a fans reps meeting ages ago. It is really difficult to decide there and then what you think. I thought it looked quite smart. However, the clip art thing had not come to light then and that is a big factor. As the large badges have gone up on the stadium and the logo appears on all the publicity, I am less and less comfortable with it. After all, it does not convey our identity – which is the very role of a logo. We’re not a kindergarten or amusement park where perhaps being represented by a cuddly lion is all well and good, we are a football club. We are not the Lions. Never have been. Never will be. I was at that initial meeting, one of about a dozen people who was introduced to our new logo and our new strip. We were told then that the club had no choice; that it was down to copyright issues; that a top designer had been employed and that ‘every avenue had been explored’ in trying to keep the Loggerheads within the frame of the design. We were told that much time and effort had gone into this. What we have found out since suggests we may very well have been hoodwinked by the hierarchy into accepting what they knew would be an unpopular badge. We told our friends and family the same story the club had given us, namely that they had had no choice. Quite what went on and the reasons behind it I doubt we will ever know. But I know more than ever that the things we were told at the time just do not add up. One has to ask questions of an organisation, one that relies on its close proximity to the local community and heritage as well as a small but loyal customer base who, one summer go about changing their corporate identity without any consultation, apparent prior thought and in doing so create out of nowhere a standalone identity that has nothing to do with what went beforehand. Not even MK Dons were so blatant as to do such a thing. The badge is, or should be, much more than a just a logo. It should, along with the official colours, be a timeless representation of the club. Players and managers will come and go, but the badge should be sacrosanct. Updated versions are fine, but the essence should remain constant. I feel we suffer from one of the weakest and most confused identities in professional sport. The so-called problem of not being able to copyright the Loggerheads logo has come up before at other clubs, and it’s not an impossible problem! In 2005, the new Chelsea board actually canvassed the opinions of their fans, found that the vast majority wanted the old badge back, and commissioned a “stylised” version of the old badge. Full copyright control, and not too big a departure from the original. I can’t stand the new Salop badge, and rather than buy the shirt I’ve gone to Toffs and spent £40+ on the “Spinal Tap” shirt. That’s money lost by Shrewsbury. If many more people feel the same I can see a return of the Loggerheads badge in the future. After all, what’s the point in having copyright control over something that nobody particularly likes? Identity is the most important aspect of a football club; without it, what’s the point? Success has no meaning. It is time the club acknowledged its mistake from 2007, stopped making falsified and powder-puff excuses about copyright/merchandise, and returned Shrewsbury Town to its rightful badge. Whilst “clippy” is our logo I still get a twinge of nausea every time I see it: every time I see a five year old kid wearing a hat with it on, every time I look at a programme, every time I look at a photo of the Greenhous Meadow or walk into our stadium car park, every time I put on my Shrewsbury shirt, even! And that hasn’t changed now we’ve achieved something with it… it has to go! We can do better than clip art. There are things we have that are unique and we should be proud of: Loggerheads, blue and amber and the river loop. The badge should invoke this pride and not be a source of embarrassment and unoriginality. It makes me cringe every single time I see this commercial vandalism of our club emblem. Plymouth Argyle’s crest, for example, clearly signifies their proud maritime history and yet our badge features a joke clip art animal that has nothing to do with us. Embarrassing. I am all for the club looking to maximise revenue streams to enable us to remain competitive, however that needs to be balanced against respecting the history & tradition of the club or else it loses any soul or meaning. You are moving towards franchise football if absolutely everything becomes about money. I have always thought that dispensing with the club’s identity for a quick buck was a disgrace. I know that STFC need to make money but not at the expense of the one thing that symbolises us; our badge. Shirts can come and go, but the Loggerheads should stay. I’ll stick with my replica top from 1979. I’m a proud Salop fan but above that I’m a proud Salopian and for me the club has to have a link to both the town itself and embrace the club’s rich history. Identity and heritage are huge issues for me. As important as those on the pitch. And there is no reason why they have to be mutually exclusive. As for creating a distinctive ‘unique brand’, I was playing down at Wimbledon for the Away Supporters the other day (the one time I have to wear that Clipart s**te…). Walking past a group of kids who had just finished their match, the one looks at my kit and says to his Dad “Which team’s that?”. The Dad replies “think it’s Millwall”. The kid comes over, looks at the badge, goes back to his Dad and says “no, it’s Chelsea”. Says it all really. Would Liverpool FC replace the Liver bird on their club crest with an image of a cartoon boat or something similar…? It would destroy and betray that club’s history and heritage and its sense of belonging to the community it represents. On a much smaller scale that is exactly what STFC have done. The badge has nothing at all to do with Shrewsbury. The fact that it has been cobbled together on the cheap with a clip art image just adds to the fact that it is not up to our and our team’s high standards. I want it to be replaced by something that will make me proud. When the Loggerheads flew over the new Wembley I honestly got a lump in my throat. Two years later, it didn’t feel like it was my club any more. I have followed the Shrews since the seventies. It’s a club that deserves a club badge that acknowledges the history of the club and the town. The current badge is clearly not suitable. I’m a Hereford United fan who is supporting your petition from Poland. “Clippy the Lion” has given us endless amusement but the pathetic commercialisation of football has to be stopped! The Loggerheads are part of the club’s heritage and strengthens the association with the town, the county and the community. There is no reason why the Loggerheads cannot be incorporated into a proprietary and protectable emblem. The club was given very poor legal advice if it believes otherwise. Finally, there’s the commercial argument; the lion logo is unpopular and this dampens demand for merchandise. The use of a piece of clip-art is frankly ridiculous and embarrassing. 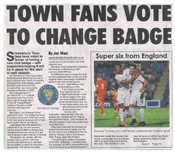 I understand the need to change the badge in order to protect Shrewsbury Town’s brand, but you must at least keep a semblance of the club’s history within any new design. The Loggerheads as a concept can be trademarked. Have a designer put some effort in rather than messing around on Photoshop! 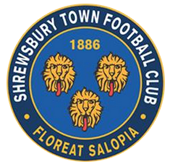 The Loggerheads and the Floreat Salopia motto is what Shrewsbury is all about; anything less devalues the history of the town and its football club. 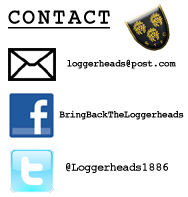 The Loggerheads is our history, our unique identity, our relationship to our beautiful town. None of which applies to the badge we are currently using. I love the Loggerheads and feel just as strongly about it now as I did 5 years ago. This is about how we represent ourselves – not about questions of loyalty to our club. There is no point in arguing with those blinkered naysayers who make comments like “it’s only a badge” or “the players are more important”. They just don’t understand the importance of identity in football, and they never will. The Loggerheads will always be the true badge of Shrewsbury Town Football Club. I believe it should return. I want to see Shrewsbury Town wearing our kit and badge. If people are so desperate for success that they are prepared to completely sacrifice our identity, I don’t know why they are supporting Salop in the first place. Always makes me chuckle to read club apologists on Twitter giving it the whole ‘I don’t care about the badge anyway’ claptrap. The club have already stated that fans will be involved in the re-brand process. You can bet your bottom dollar that the ‘who cares’ brigade will change their tune when this time comes! UP THE LOGGERHEADS!